mistermikev had the most liked content! build is looking really good. the cream/pine is a lovely combo - you might want to find some cream pu rings as that would just tie in nicely. I don't want to come off as a negative nelly here... but you might have some noise problems with that wiring... it doesn't look like green orange and red are shielded... and they really should have a braided shield IME. I say this because I have learned it the hard way. semi-hollows - since they aren't shielded at all on the inside... are prone to noise issues esp if you have wires crossing each other. The last thing in the world you want to do is have to rewire once you do the work to get your electronics in there. IME every single wire you use should be shielded ... even wires you wouldn't normally shield like those going to the 3 way switch. The ground can be connected only on one side... as that will form a better shielding. just a thought. what do you know about nitro lacquer? yeah... the anchor doesn't have a correct href either (yes I did roll the dice on it). "levels jerry!" you might try warming your can prior... I'm told warm faucet water will minimize this. nice neighbors. if it were me... I'd put a package out there with dogshit in it and I'd rub the outside of it with urine. leave a note telling them you have hep c too... you know... send a message. thank you sir. i keep reminding myself that in the end, even if it takes longer... I'll be happier if I spend the extra time to do it the best I can. After all, for me... this is all about learning things and who learns more then when having to redo! interesting idea. perhaps it's time to do some laundry! (my wife might think I'm cheating if she sees me doing laundry tho!) I think I just need to get a space suit and work in a vacuum! on an unrelated note... what's the best way to strip nitro? lacquer thinner or zip strip? some of them want to.... yeah, I'm sure there is. I guess my next step is to get aggressive on the sand back of the blonde. if I burn through or otherwise screw it up I can always strip it. gonna wash out my tub, maybe even whipe it down with alcohol, then line it with a new garbage bag. we'll see if we can avoid the 'floaties". it's a small wonder why the blue hasn't had issues w dust... we have 3 cats and a dog and despite hepa filter in the ac everything has pet hair on it. i guess cause it's blue I just can't see it but I'm sure it's there! "this finish was made with 30% genuine cat hair"! funny you mention that... there is one fleck of green flake that ended up in the finish. 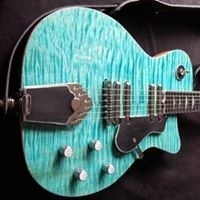 it is from a guitar I did 3+ years ago! I guess it must have been in the tub I was using but I blew it out before use... or at least I thought! it's strange... I know nitro tends to melt layers together... I got an eyelash in the finish last night and tried to wetsand it out... but it seems like it is so deep in the finish. I have no idea how it got that deep! i swear it wasn't there yesterday morning... only sprayed one layer and yet it seems like it is all the way down to the color coat. also, no spray gun here... just spray can! thank you sir. yes, finishing is always a test for me. I should have just gone poly as in the past that seems pretty fool proof to me but I really feel like I am getting better at tru oil... just need to hang in there. at this point it's more stubborn desire to 'beat it'! thank you sir. the cream one - it really doesn't take photos well but afa how it looks - it turned out pretty much how I imagined... just little specs of this and that everywhere. can only see them close up. thinking I might strip it back and this time take my plastic tub and cover it immediately after spraying. white/cream is always so difficult to do w/o imperfections! Oh, oh oh... I know what it is! it's no strings right? hehe. looks cool. who knows... maybe they just wanted the "look" of shielding! well here's the current state of my two. really struggling with these two. so this is the blue when I had it almost perfect... but had some really faint surface scratches and just wet sanded too much... now working to get back here! and this is the blonde... I'm doing this in nitro so have been shooting it in my backyard inside a plastic tub setup in the corner to try to prevent any debris... but it has really tiny stuff everywhere. I'm tempted to try spraying in my garage but I've got a gas water heater so... probably not a great idea. I am thinking I might go on the side of my house where there is a 8' area between the fence and the house for more windbreak... but az has a lot of debris in the air even when it's not windy (so dry, pollen, etc). just can't win! pretty much every evening ends up with me disgusted with them both and doing something else to keep my mind off of it! very discouraged right now.